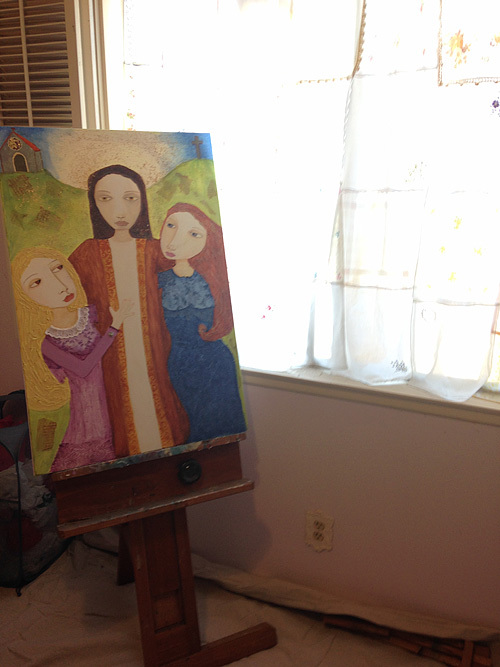 I have an update to my overhaul of my art space and it is also an opportunity to link to this year's Where Bloggers Create, hosted by Karen Valentine at My Desert Cottage. I found that I needed somewhere to put a palette/paint mixing place, and as the goal was not to use the icon writing space for anything but icon writing, I brought a piece of furniture that had been banished from the space for a few years, put some plastic wrap on it to protect the top and I'm currently using palette paper for the mixing. When I run out of that, I'll look into get some glass or perspex or something for the top. 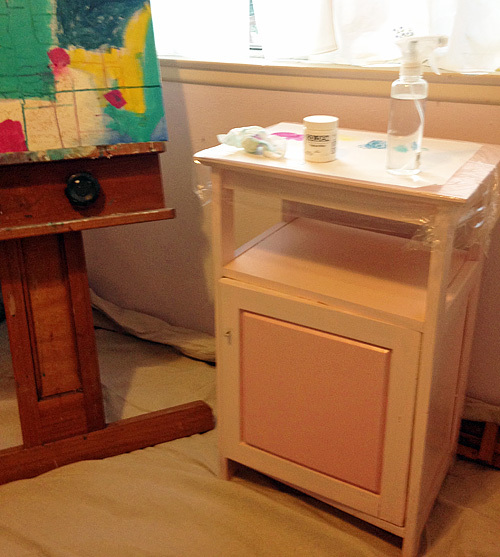 It's a pine bedside table that I painted and used for storage for a while. So if you haven't seen my overhaul that I did in June, you can see that at this link. And for previous instantiations of my craft room now art studio, you can go to this page to see all those links. I'm off to enjoy looking at all the creative rooms in this year's link party! Your painting inspired me to do one of my 4 granddaughters! good idea for your palette! What a great space. I love the natural light. very nice - I love the painting. WoW Leanne, what an incredible transformation! Love what you done with your space, it looks so much brighter! Beautiful art work!! Thanks for sharing!! Looks like a nice and bright studio. You do beautiful work. Thank you for sharing.